It's not often you come across a kugel recipe that doesn't involve eggs. But this dairy-free, nut-free, egg-free Sweet Potato Kugel is bound by a bit of whole wheat flour and lemon juice instead. Enhanced with root vegetables, apple, and a hint of bright lemon zest, it's a nice alternative to heavier potato kugels. And don't forget -- "since sweet is the name of the game on Rosh Hashanah," says Giora Shimoni, "this kugel would make the perfect holiday side dish for your New Year celebration." Whole white wheat flour (sometimes called white whole wheat) works nicely in this recipe. It is nutritionally comparable to regular whole wheat flour, but has a more delicate flavor than the regular whole wheat flour called for below. Grease an 8x8x2 or similarly-sized baking pan, or spray with non-stick spray. 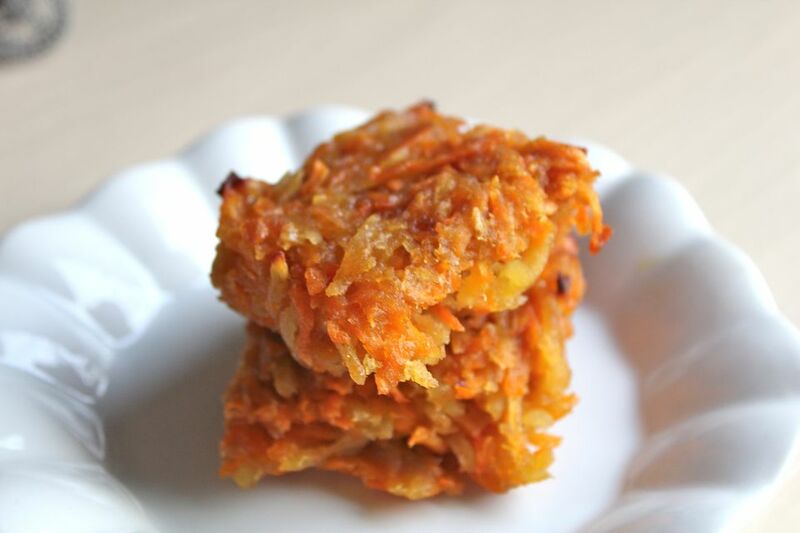 Using a food processor or box grater, shred the potatoes, carrot and apple. Add the whole wheat flour, sugar, oil, lemon zest and juice, salt, and cinnamon and mix well. Spoon the batter into pan and smooth the top, pressing down lightly. Bake in the preheated oven for 45 minutes, uncover, and continue baking for another 15 minutes, or until the kugel is set and the edges are golden.